When I arrived at Beppu for the first time, I found a strange tower in the mountain. It looked like a rocket launcher which launches scheduled space air ship in sci-fi movies. On the day, I visited the tower, paid three hundred yen at the entrance and climbed it by an elevator. The observatory was at the altitude of 100 meters and was covered with glass windows and wire net ceiling so that we can feel the outside air directly. I'm not acrophobia, but my legs tickled a bit. According to the explanation, the tower forms a part of a virtual sphere which has 1 kilometer of radius. It was built as a part of business convention center named "Bcon center", but there was no one except me both in the tower and in the convention center. We can often see such wasteful buildings especially in local cities. In most cases they are built by using tax for the benefit of particular people including politicians and local power. It has been said that the local economy in Japan is exhausted, but I think it would be better by stopping such a waste of tax. I agree. 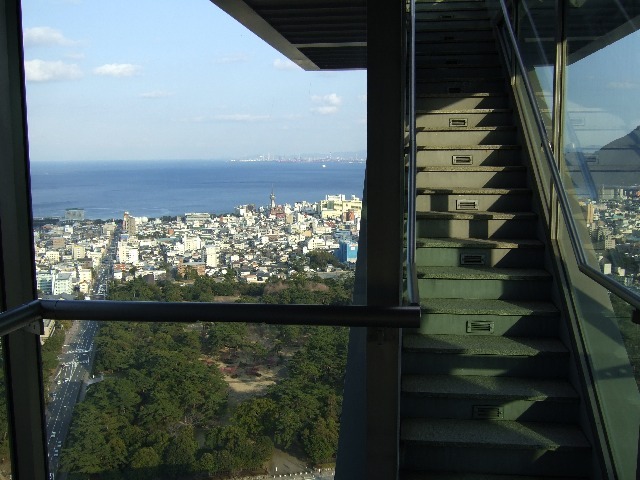 There is another example in Shimonoseki called "Kaikyo Yume Tower." The one in Shimonoseki looks more gorgeous and therefore more wasteful and stupid.